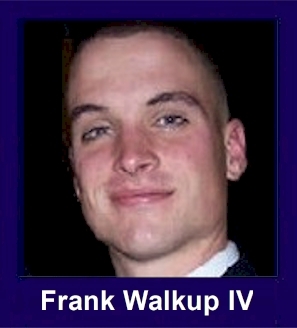 The 35th Infantry Regiment Association salutes our fallen brother, 1LT Frank B. Walkup IV, who died in the service of his country on June 17th, 2007 in the Rashad Valley, Iraq. The cause of death was listed as Improvised Explosive Device. At the time of his death Frank was 23 years of age. He was from Woodbury, Tennessee. First Lt. Frank B. Walkup IV of Woodbury, Tenn., had two passions -- his family and his fellow soldiers, said the slain officer's father. "He was a natural leader whether it involved taking care of his siblings or his men," Frank Walkup III, told the Star-Bulletin yesterday. Walkup IV, 23, died Saturday in Kirkuk, Iraq, from injuries he suffered earlier in the week when a homemade bomb exploded while he was on foot patrol in Rashad Valley. He was the third Schofield Barracks soldier to die in Iraq in the last week. His father said that after graduating from the University of Tennessee's Army ROTC program two years ago his son hoped to make a career in the military. He was assigned to Schofield's 25th Infantry Division in March 2006. He was the 22nd soldier assigned to the 25th Infantry Division's 2nd Battalion, 3rd Brigade Combat Team, to die in Iraq since it arrived in Iraq last summer. The elder Walkup said the last time he talked by phone with his son was two weeks ago. "We talked about his family and his men. He was the eldest of nine siblings, so we always had a lot of catching up to do," he said, adding that his son was "bright and cheerful." Besides his parents and eight siblings, Walkup is survived by his widow, Sabita, a former University of Hawaii tennis player. They were married in September 2005. Funeral services are planned for July 4 in his hometown in Tennessee. In May, Walkup's platoon was featured in a Christian Science Monitor story when it was assigned to a remote outpost called Doria in Rashad Valley southwest of Kirkuk. Platoons from Schofield Barracks' 3rd Brigade have been rotating into Doria, named after Staff Sgt. Richard Doria, who was killed there in November, for six days since February. Normally, they are stationed at a larger base called Warrior, 30 miles from Kirkuk. The Rashad Valley is known as a Sunni Arab stronghold, the newspaper reported. The mission of the Schofield Barracks soldiers is to keep the valley from returning to the insurgents, who controlled it six months ago, the newspaper reported, and help the mayor, city council, Iraqi police and Iraqi army establish legitimacy. During a seven-hour patrol in late May, Walkup's unit discovered a large homemade bomb. "It's like fighting ghosts out here," Walkup said then, referring to the insurgents who planted the bomb. "We have a huge area to cover and you may not see that much going on, but we have proof enough there are out there."